Looks great. 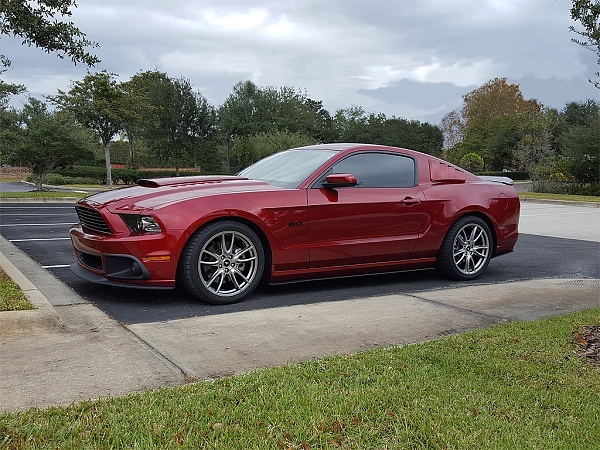 I might have to get that splitter set for my car since I already have the GT500 valence/quad exhaust. The splitters really changed the way the car looks. It looks like it's lower and fuller on the side. It's just an appearance thing, but in my mind, they improved the look and didn't cost that much at all. I don't know, I'm kind of indifferent on the roush fogs. Your car looks good either way. I have a basically stock track pack Ruby red like yours and this is exciting to see since these are all mods I've contemplated... 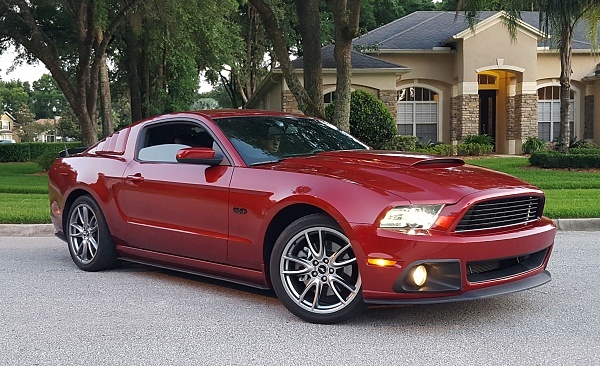 I'm not sure if I want to go the full on black and red way, but I like how yours is turning out if I take out the grille fogs (which I am apprehensive about) I would definitely go with the roush fogs. I'm not a fan of black wheels. I think they're a trend that's almost played out. 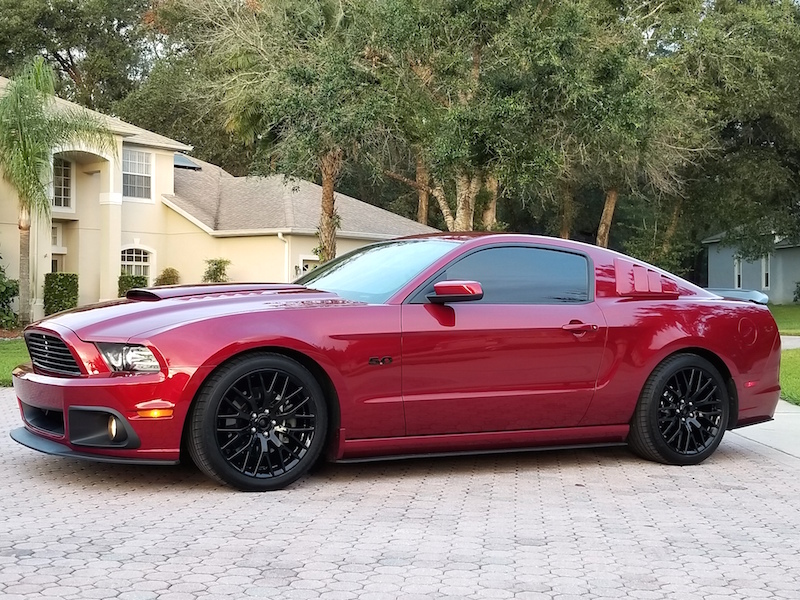 I also don't think that the factory silver GT wheels look good on this color car, so these Brembo's are just about perfect being a light charcoal color. They aren't too dark and they aren't too light. 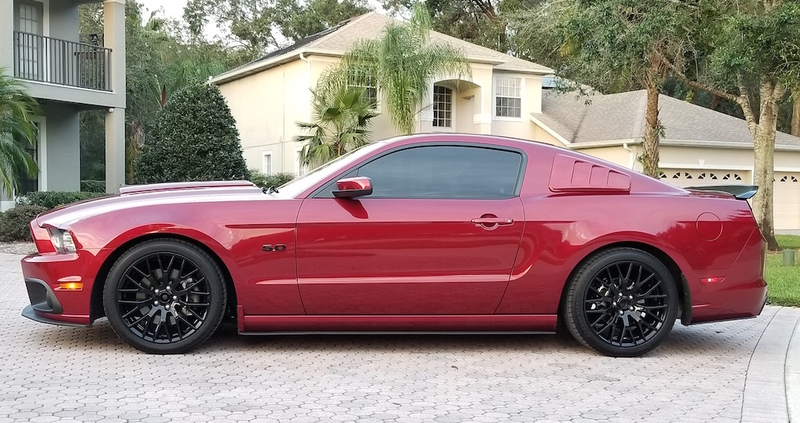 Any chance anybody needs Roush 1/4 window louvers in Ruby Red? My son didn't like the look so they were never installed. So much for that surprise. I also have a Ruby Red factory spoiler if anybody needs them. My son finally decided that he wanted the Roush louvers put on the car. So, I added the louvers, rotated the tires, detailed the wheel wells, cleaned and polished both sides of the rims, washed and waxed the car and gave it a full cleaning to prepare it for driving in the rain again tomorrow!!! I have received a few PMs asking how the two cars look together, so I took a picture. It's not the greatest photo as the lighting was getting dark, but it's a start. Wow Mustangs sure look like pigs next to that old Camaro! Watchdevil, that Probe brings back memories. I used to have a 1990 Probe GT that was fully loaded. I loved that car - drove it for 8 years. Mine is a daily driver and I cannot seem to kill it. I am totally perplexed whether I should keep it or let it go because it needs some work right now for it to keep on going. It really is an underappreciated great driver though it did not have the mighty drivetrain the Mustang GT's did. It was indeed designed to be the 4th generation Mustang that was to compete with the canceled GM-80 FWD F-body program. It needs tires, brakes, air conditioning repair, a new LH axle and there is no telling what else once it gets a proper inspection for the steering and suspension. It uses about 2-3 quarts of oil per month too but it still runs strong. I repaired the bushings in the shift linkage a couple of years ago to get rid of the slop and it shifts so good. It has mechanical shift linkage and not that cable crap. It needs reconditioning. The "dead leaf" colored paint is faded pretty badly, many places down to the primer. The interior needs new carpeting and headliner along with a creative solution to cover the dash. The original padding disintegrated so I removed it all exposing the black platic dash shell underneath. I have a few personal mods. 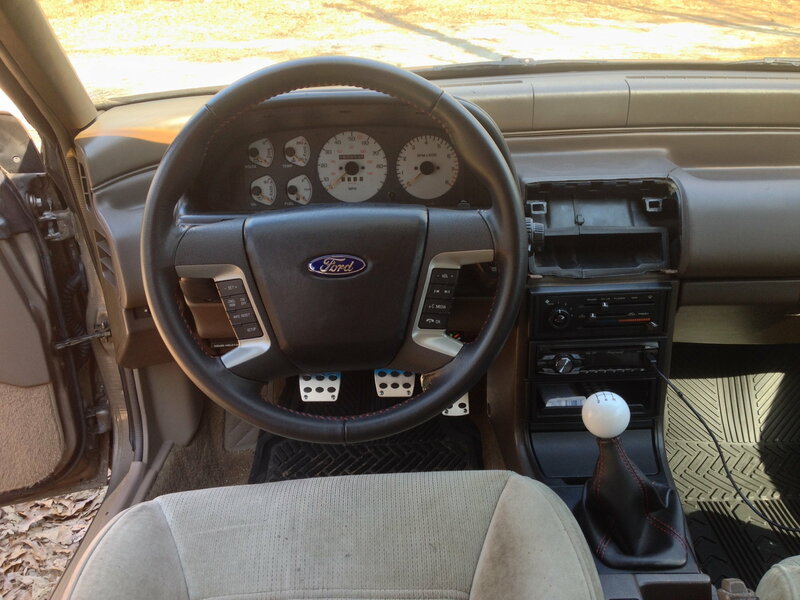 I installed a leather wrapped Ford Fusion steering wheel whch I restitched in red thread. I replaced the shifter with a short throw Honda Civic aftermarket unit. I installed a red stitched boot around it and topped it off with a white ball shift ****. I installed white faced blue glow gauge faces, a touchscreen Audio/DVD player and color changable underdash LED lighting. This was only intended to be a temporary car until I could do better. 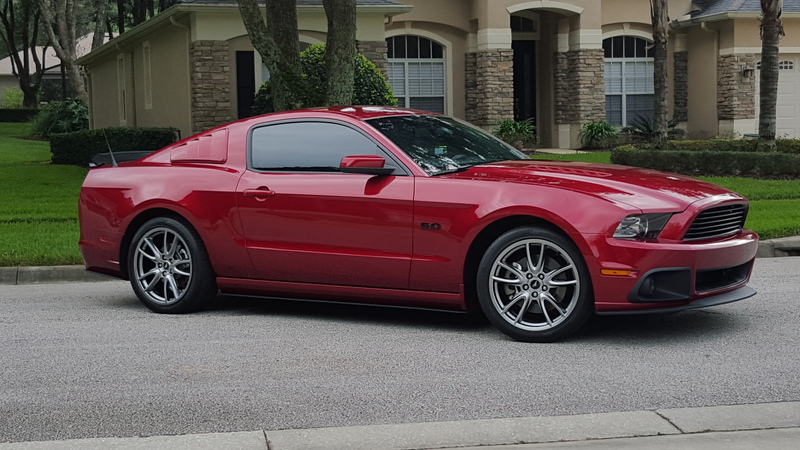 If I am lucky in the near future I might be able to get a 2005 style used Mustang, or very lucky a 2010 style. 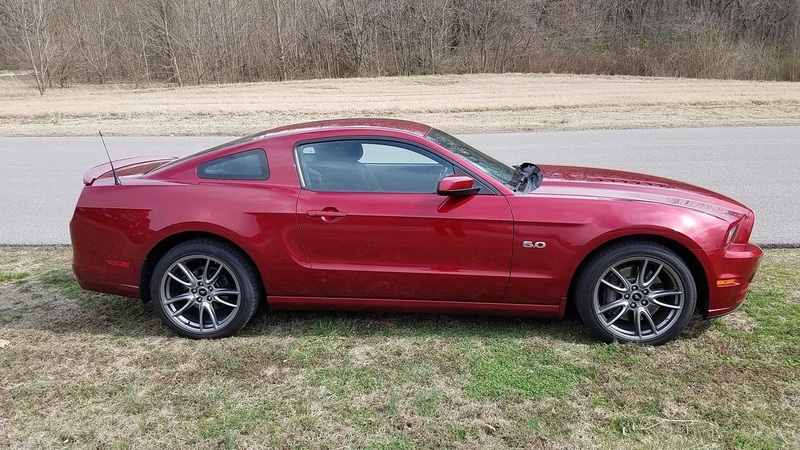 I will never be able to afford again a new Mustang or even one a couple of years old. Love what you've done with the car, it looks great. Our 2013 looked enormous next to our 88GT. And I can tell you that the newer cars are much larger because when I'd wash them both, the 88 took a lot less time to wash, even though the 13 was a vert & I didn't have to wash the vert top. Today, we added the Roush hood scoop. The body shop fixed the door after somebody backed into it and while painting the driver's side, they painted the hood scoop for me. Today, we installed it. All that's left on the appearance side is new wheels. Those are coming soon. Well, I finally lowered the car. I installed Eibach Pro lowering springs (1" front and 1.5" rear) and the car sits really nice now. I took it to a couple of shops for an alignment, but the car couldn't be driven onto their alignment racks. It was bottoming out about the mid length of the car. Now to find someone that won't rip me off. Tire Kingdom said they will charge me $89 if the car is stock lowered, but if it's aftermarket lowered, they want to charge $129. What a ripoff. I'm getting here late in the game but...I picked up a 2014 GT in Ruby Red back in Nov 2016. I'm planning to do some of the same mods you've done to yours. I was wondering how much effort it was to install the side and rear-side splitters? I plan on swapping out the factory GT spoiler for a body-color GT500-style unit also. Love the Ruby Reds; they really POP! The splitters are very simple to install. You just need to remove a few plastic plugs, drill two on each side and install new plugs. That's it. The front required more work. I forgot to update with the latest. People said I needed to lower the car, and I said it wasn't going to happen, but as you see above, I did lower it. Then someone suggested black wheels, and I said that wasn't going to happen, but here it is. 2017 GT Performance Pack wheels. Last edited by scottmoyer; 11/10/17 at 07:19 AM.